Saturday, Sept. 22, vendors selling homemade soap, original clothing items and baked goods lined the street as residents sped by on motorized scooters, danced to live music and indulged in crepes and barbecue from food trucks at 30th Street and Troost Avenue in downtown Kansas City, Missouri. 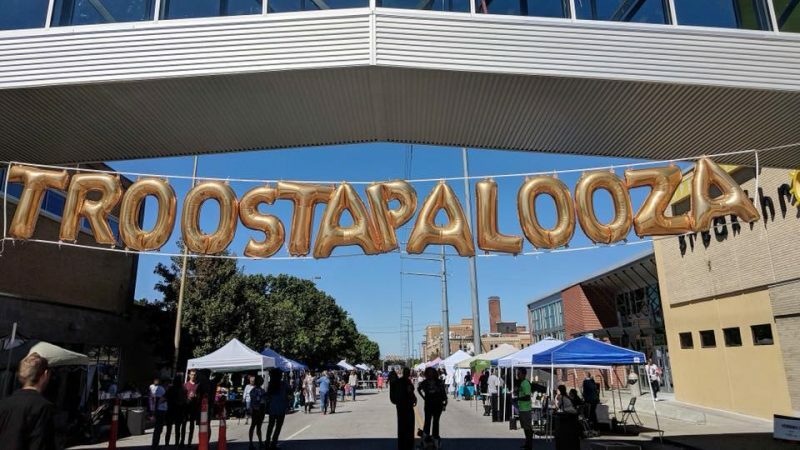 This lively evening on Troost was the aptly named Troostapalooza – a new festival created with the goal of uniting the community by involving small business, neighbors and entrepreneurs in a celebration that encourages awareness and raises funds for non-profits. Troost Market Collective (TMC), a non-profit, headed the creation of Troostapalooza. Katie Mabry van Dieren, one of the organizers of Troostapalooza and the director of arts & programming at TMC, spoke about the non-profit’s mission. “Troost Market Collective’s mission is to create equitable economic opportunity for creative entrepreneurs, inspiring future generations through innovative partnerships and programming,” Mabry van Dieren said. The festival was supported by several local organizations, including Operation Breakthrough, TREH KC and The Strawberry Swing. 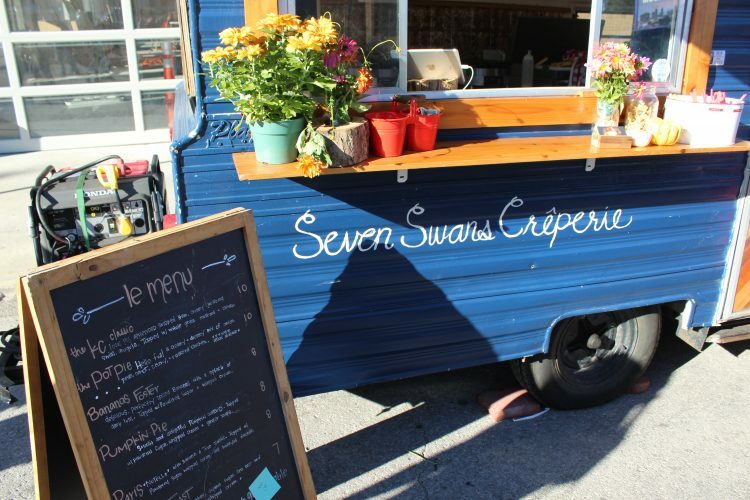 Over 72 local small businesses engaged with the festival in some way. Some local organizations contributed by interacting with guests directly, like the University of Missouri – Kansas City’s basketball team, the Roos, who played basketball with guests in a nook near the live music stage. 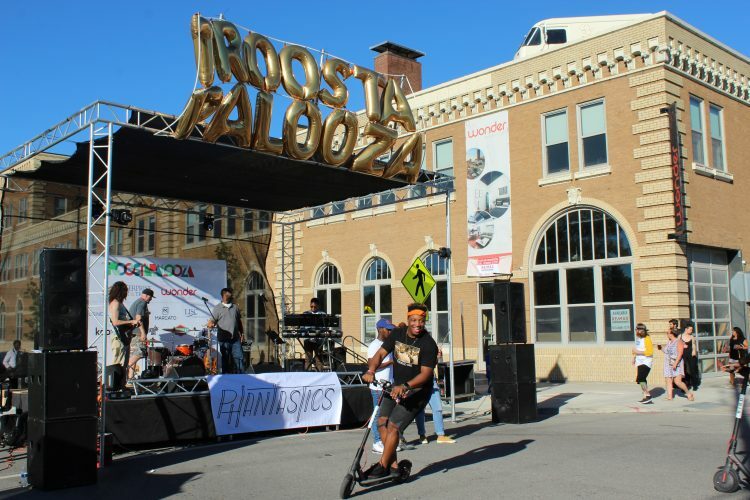 Man rides electric scooter in front of Troostapalooza stage. People dance to music at Troostapalooza. Mabry van Dieren explained the communal significance of the organizations selected to support the festival. For most Kansas City metro residents, Troost is a well-known location – notorious for its status as an essentially tangible dividing line between racial groups. This border represents far more than racial divisions. Disparities in income, healthcare, education and, most significantly, economic status are clearly divided by Troost – and they all point back to evident historical causation. 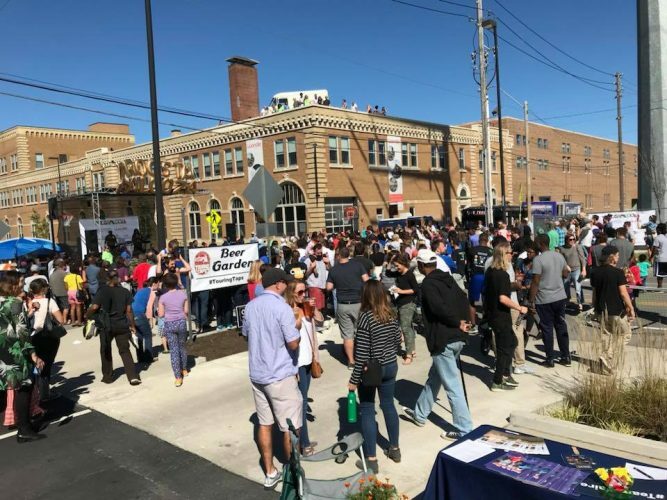 When asked if one of Troostapalooza’s goals was to address the racial division that Troost marks, Mabry van Dieren confirmed that one of the functions of the gathering was to assist reinvigorating the area – spurring the redevelopment of a thriving, sustainable and diverse community. The slaves’ labor mainly consisted of clearing the forested areas that surrounded the plantation. The cleared area became the setting for a neighborhood known as “Millionaire’s Row,” constructed by Porter – who maintained his fortune after the Civil War by selling real estate along the property. In the 1880s, the country experienced an economic boom, which prompted Porter to begin constructing moderately priced homes to appeal to a larger consumer base. However, this backfired when the economy crashed in the early 1890s and house prices dropped, forcing contractors to sell to the generally less wealthy black community. In the decades after black people started moving onto Troost, the community did not stop growing. This is most likely because, before desegregation, it was the only area with post-elementary access to education for black individuals. Practices of real estate moguls – who used tactics like redlining and blockbusting to keep certain neighborhoods wholly white or wholly black – enforced isolation of black residents into the area. Redlining is the practice of denying services to residents based on financial risk, which predominantly affects people of color, and blockbusting is the practice of convincing owners to sell their property at low prices in order to maintain homogeneous neighborhoods. Even after the major advances in civil rights in the 1950s and ‘60s, these racial divisions remain, and the economic inequality that arose as a result of the devaluation of the area by real estate moguls still significantly affects residents east of Troost. In a 2017 study, TIME ranked Kansas City the fifth most economically segregated city in the nation, with the most obvious evidence of this segregation being along Troost. Troostapalooza may not be the solution to this segregation, but it certainly has the potential to lay the groundwork to eventually get there. After all, the festival’s ultimate goal was to coalesce the community while emboldening local small businesses and organizations. Mabry van Dieren deemed this goal met. 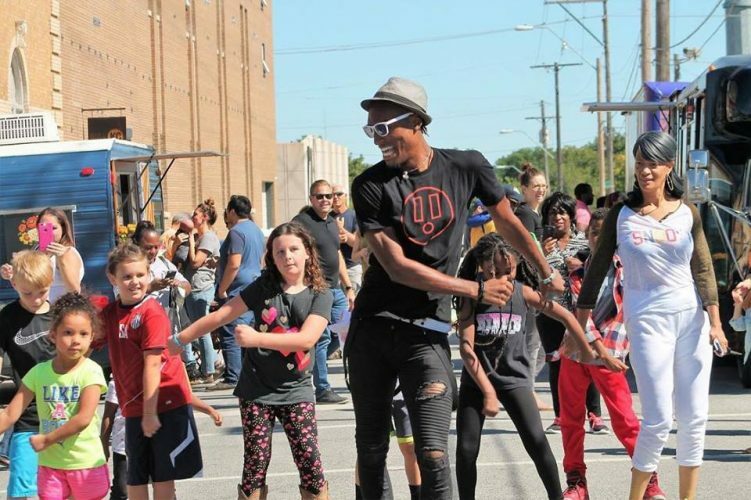 “We saw a beautiful and diverse gathering of folks, young & old, enjoying each other’s company and participating in all the activities, dancing, listening to music, playing basketball, watching the skateboarding demo, playing in the bounce houses, shopping our vendors and meeting and talking to new friends,” she said. Mabry van Dieren indicated that there are plans to make Troostapalooza an annual event. Photos courtesy of Christina Kirk and Katie Mabry van Dieren.